"I don't know if I like the sound of a bath." It can be daunting to try anything new on kittens, especially bathing. Since most adult felines despise water, it can be a safe assumption to think that a kitten may not love it too much, either. However, starting early can often help in the long run. In the earliest days and weeks of a kitten's life, actual bathing may not be the most suitable idea, although that doesn't mean cleanliness has to go out the window. Mother cats, when around, usually handle a lot of their kittens' basic grooming demands, although it may be necessary for you, as a caretaker, to occasionally help things along. Do this by employing a hygienic and moistened soft cloth or cotton balls, both of which can be effective in softly eliminating debris, dirt or any remnants of stool on the kitten's body. If a kitten is at least 8 weeks of age, you can begin to bathe him using kitten shampoo, according to the Animal Compassion Network. Never use shampoos made for people or for cats of any age. Grooming products made for people are way too aggressive for felines, especially wee kittens. Instead, take the safe and smart route and opt for a gentle kitten-specific shampoo. Take great care to ensure that you never allow any water or kitten shampoo to get inside your little one's mouth, ears or eyes. 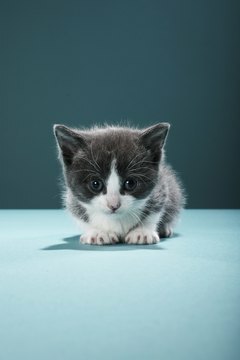 If you can start your kitten bathing at an early age -- say merely 8 weeks -- then it may be easier for you to continue bathing him on down the line. Although cats are meticulous groomers and don't usually need baths, bathing is sometimes inevitable. Whether your cat enthusiastically rolled around in mud on a rainy day or got some peanut butter all over her back, good, old-fashioned baths are sometimes the only solution. The longer you wait to start your cat, the harder it may be for her to take to the whole concept. Fleas aren't uncommon in kittens, especially if they started their lives outdoors. In most cases of fleas, careful extraction of them with combs can be highly useful and reliable. In extreme cases, however, warm-water bathing may provide better results. It is crucial to immediately and exhaustively dry your kitten once his bath is completed, as coldness is a major concern in these youngsters. It is also important to never place wee kittens' bodies entirely in water. Flea medications and shampoos are often major no-nos to young kittens who are merely weeks old, so first always attain veterinary approval. Closely observe all product labeling. If your kitten is not old enough for a certain product, he must not use it under any circumstances, period. Flea products sometimes can be life-threatening to small kittens, so take this matter seriously. When it comes to fleas, immediate action is a must, otherwise it can bring upon anemia and other issues.